We’ve received our International Bitcoin Debit Card that is linked to the free Xapo online Bitcoin wallet and Vault and we were very eager to test it out. Earlier this month we’ve tried out the Xapo Online Bitcoin Wallet service and you can read our first impressions here, though the thing that we were most interested in was the ability to link your Bitcoin wallet to an International Debit Card and use the card as any normal debit card, but when you pay with it or withdraw money they are converted instantly from your Bitcoins in the wallet. Xapo has apparently partnered with My Choice as a physical card provider and the card we’ve got is not yet a Xapo branded one as apparently all of the earlier cards are, though in the future they should come as Xapo-branded International Bitcoin Debit Card and not as you see on the photo above a generic debit card with a VISA logo on it. The card we’ve got is with 3 years validity and comes with both magnetic stripe and a chip, but no contactless payment option is supported. 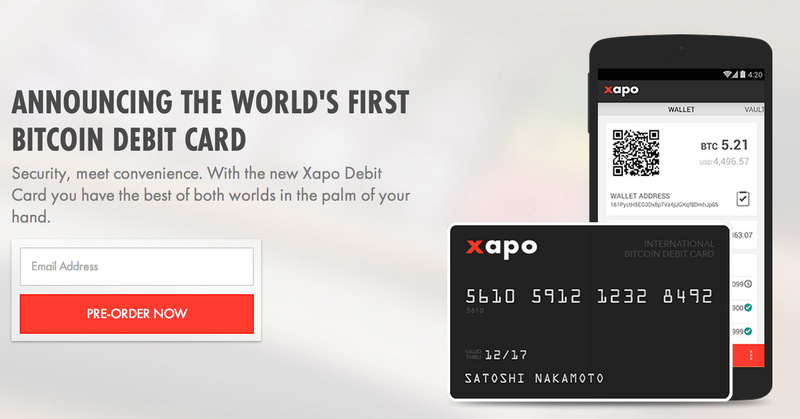 Do note that Xapo is still in beta testing with their debit cards and have not yet launched the card publicly. You can currently pre-order your card and thus get in the list for an invitation to get it when it becomes officially available, though there may be some options to get is faster such as the one available for EU users if they purchase some BTCs from Xapo via a bank transfer. Once you receive your Bitcoin debit card you need to activate it first via a special website or by calling a dedicated phone number and also get your PIN code (can be done over the phone only!). This is done through the My Choice’s website, though once you activate the card it will be automatically linked to your Xapo wallet, so don’t worry when you see that you have 0 balance in your My Choice account. It is completely normal to see a zero balance in USD or EUR as you actually do not have anything inside the card, when there is a request for a transaction it automatically converts Bitcoins from your Xapo wallet to cover the needed amount. This happens instantly, so there are no additional delays or things that you need to do in order to use the card, you can use it as easy as like any other debit card. There is also no difference to the merchant you are paying when you use a normal debit card or the Xapo debit card linked to your online Bitcoin wallet as the merchant gets the requested amount in the local currency in both cases. The Xapo Bitcoin Debit Cards are available in either USD, EUR or GBP currency (you can choose the currency when you fill the form for your card to be sent to you). Here ate the standard fees associated with the international debit card that you will get and that will be linked to your Xapo online Bitcoin wallet. Do note that while there is a monthly service fee included in the chart with the fees, this fee is going to be covered by Xapo, so for the end user there will be no such monthly fee included. Also note that currently Xapo is not charging the planned, one-time ordering fee of $15 USD for the card, while the card is in beta. In the future however this amount will be debited from your Xapo Wallet in Bitcoins when you request to get a debit card linked to your account. As you can see there is a 3% foreign currency conversion fee, so make sure you have the card set to use the main currency you will be using in order to avoid paying that extra fee unless you go abroad and want to pay with the card. This table shows what are your Xapo Bitcoin debit card limits, by default once you get your card it will be with the Standard limits applied and these are a bit restricting for the total of both POS terminal purchases and ATM withdraws. After you get the card you can upgrade your status to increase limits, and to do so you need to contact Xapo. This is recommended mostly because it removes the relatively small total limits to the lifetime purchases and ATM withdraws you can do via the card. When you make a purchase or withdraw cash via the Xapo Bitcoin debit card you will immediately see the transaction in your online Bitcoin wallet at Xapo, but that transaction will pretty much list that a certain amount of BTC was sent from your wallet. 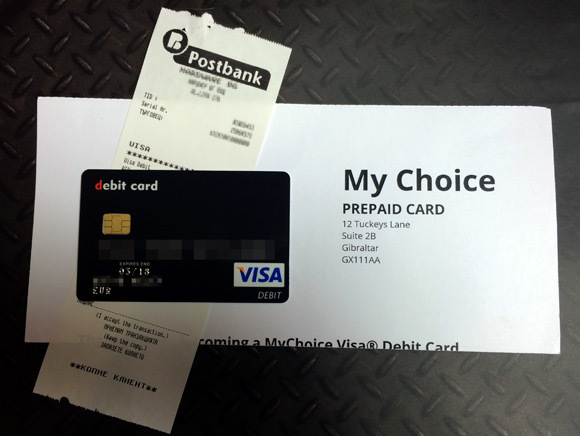 In order to get extra transaction details about the merchant, how much you’ve paid in a local currency and in the card’s currency you would need to login to your My Choice account that you created when you activated your card. So our first impressions from the International Debit Card provided by Xapo that is linked to your free online Bitcoin wallet at Xapo are very positive. The card is as easy to be used as any other debit or credit card as long as it is not empty in terms of balance, or in this case if you have some BTC in your wallet. Everything runs smooth and problem free when you pay on a POS terminal or withdraw cash from ATM, what you just need to make sure is that you are familiar with the limits and fees associated with the card to save yourself some possible issues in the future, so make sure you read them carefully. We are going to continue using our Bitcoin debit card for different payments to make sure that there will really be no problems doing various payments with it as we expect it to be. This card is really convenient thing to have in your wallet as it saves you the time and extra trouble of sending Bitcoins from your wallet to an exchange to convert them to USD, EUR or GBP for example and then withdraw them to your bank account that might be linked to a debit card that you can use.